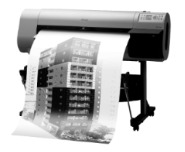 The 5-color Canon imagePROGRAF iPF710 is capable of printing a max. output size of 36” wide (A0+), 2400 dpi x 1200 dpi. imagePROGRAF iPF710 delivers optimal image processing of large CAD/GIS drawings, posters, large volume data and business documents. imagePROGRAF iPF710 also comes with large intuitive user display panel, ink level detection and paper capacity monitoring functions. It also enables HP-GL/2 and HP RTL for new connectivity. Print Speed: A1 Roll (Draft): 34 sec. / A0 Roll (Draft): 55 sec.